Boost productivity and maximize your workspace with the stylish and compact HP Slim Wireless Keyboard and Mouse, designed to complement the 2015 class of HP Business PCs. Pair your PC with a sleek, restyled, reduced-size keyboard that packs a familiar notebook-style layout and function keys into a smaller1 design to give you more room on the desk. The comfortably intuitive, low-profile, quiet keys make data entry easy. 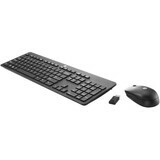 Interact seamlessly with a full keyboard layout and a mouse that's designed for either hand. Feel free to move around the desk or table with a keyboard and mouse that keep working up to 30 ft (10 m) away from your PC through a single USB dongle that has 2.4 GHz wireless connectivity. Avoid surprises with convenient software notifications that warn you when you need to change the batteries.